It's May - hopefully Spring has finally found you wherever you may be! I know it's been a rough one for much of the US this year (really, SNOW in Kansas City in April?!? My grandmother is not pleased, to say the least.) and weather patterns all around have been getting more and more abnormal it seems. I'll admit it, I love living in a place where the seasons flow from winter into spring then summer and fall and back around again. Okay, great, what does this have to do with T-SQL Tuesday, anyway? Here's what I thought it would be fun to share with the community this time around - we all experience change in our work lives. Maybe you have a new job, or a new role at your company. Maybe you're just getting started and you have a road map to success in mind. Whatever it is, please share it next week, Tuesday May 14th. Make sure you note what technologies you find are key to your interests or successes, and maybe you will inspire someone to look down a road less traveled. One thing I think would be great to see included in these stories is to hear about how you always thought technology "X" was so awesome, and either it lived up to the hype for you, or maybe it morphed into something else over time. Let's make these stories about the tech and how that has led you down a certain path. Your post must be published between 00:00 GMT Tuesday May 14, 2013 and 00:00 GMT Wednesday May 15, 2013. 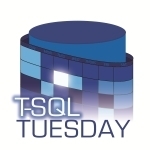 Your post must contain the T-SQL Tuesday logo at the top (see above) and the image must link back to this blog post. Trackbacks should work, but if not please put a link to your post in the comments section so everyone can see your contribution! Don't forget - you can use the #tsql2sday hashtag on Twitter, too. Huge thanks once again to the incomparable Adam Machanic (@AdamMachanic) for the T-SQL Tuesday format. This is what #sqlfamily is all about!